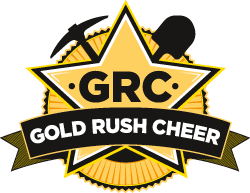 At GOLD RUSH CHEER we make annual trips to the local competitions in Perth, as well as interstate changing which events we attend each year, please see enrolment package for more information. At GRC we have a fundraising committee called GRCAA, where you can access lots of help for attending competitions please contact us to find out more. If you are committing to competitive cheer you must attend training sessions every week unless there is a substantial reason not to be there, even if you have an injury you still need to attend training sessions so you don’t miss out on any changes. You will also be required to attend any extra sessions that may be put on before heading to comps. This also means you are required to perform at any local events throughout the year as well as the end of year finale show. Group stunts work together to produce a short one minute routine with continuous and creative stunt sequences. A group stunt consists of four or five members and will be offered to athletes that have been to competitions before or have had previous experience. You will be required to attend extra training sessions for this.